Sierra Leone: Where Colin Powell Felt His Roots : Goats and Soda The West African nation is in the news today because of the tragic Ebola outbreak. It once played a part in another tragedy: the U.S. slave trade. 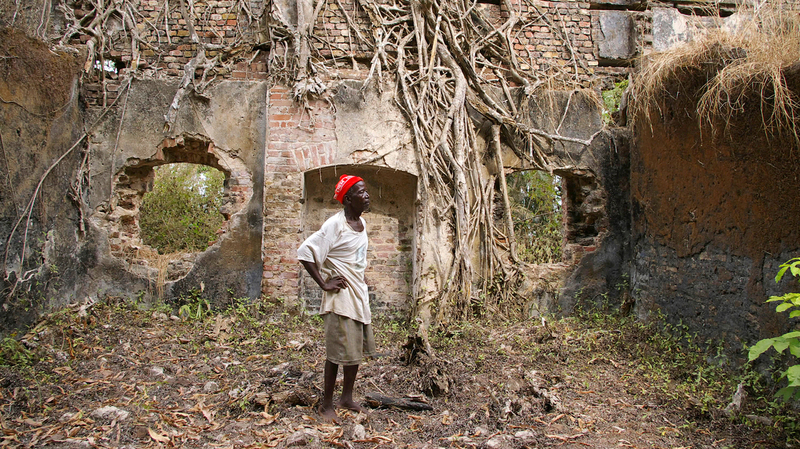 Braima Bangura, a caretaker, stands amid the ruins of Bunce Island's slave castle. Africans destined for slavery in the rice fields of the American South were held here. The media are focused on Sierra Leone this weekend, as the Ebola-embattled nation has set up a three-day lockdown to help control the disease. Aid will be coming from the United Kingdom, which once ruled the West African nation. But the country also played a painful role in U.S. history, dating back to the dark days of slavery. Thousands from that part of Africa were captured, enslaved and sent to the sprawling rice plantations of Georgia and South Carolina. Sierra Leone was first charted by Portuguese explorers in the 15th century. In 1462, Pedro de Sintra gave the country its name — which means "Lion Mountain" in Portuguese — after the lion-shaped mountains above what was to become the harbor in Freetown, now the country's capital. By the mid-1700s, this whole stretch of West Africa had become known as the Rice Coast because of the quantities of rice cultivated in steamy lowland paddies. That drew the interest of American slave owners. They, too, were growing rice, but it's tricky to cultivate. And the agricultural workers of Sierra Leone were skilled at planting, growing and harvesting the crop. Consequently a slave from Sierra Leone commanded a premium in the markets of Charleston and Savannah. A fortress at Bunce Island, 20 miles from Freetown, quickly became the site of one of West Africa's major slave trading operations. Bunce Island continued to be a major slave exporting center until 1807, when Britain abolished the slave trade. Sierra Leone itself remained a British colony until April 27, 1961, when it gained independence. The United States formally recognized it as a sovereign nation that same day and has maintained diplomatic relations ever since. As for the slave trading fortress on Bunce Island, it long ago fell into disrepair. In 1989, the U.S. National Park Service announced a preservation plan for the fortress, but those efforts fell through when Sierra Leone erupted in a brutal civil war. By 2008, the World Monuments Fund listed the rapidly crumbling ruins, along with other Freetown monuments, among the world's top endangered historic sites. Since then, Sierra Leone has proposed Bunce Island for consideration as a UNESCO World Heritage Site. The site still has deep evocative power. Gen. Colin Powell visited Bunce Island while serving as chairman of the Joint Chiefs of Staff in 1992. That afternoon, he spoke at a departure ceremony at the Freetown airport: "I am an American. I am the son of Jamaicans who emigrated from the island to the United States. But today, I am something more. I am an African, too. I feel my roots, here in this continent."